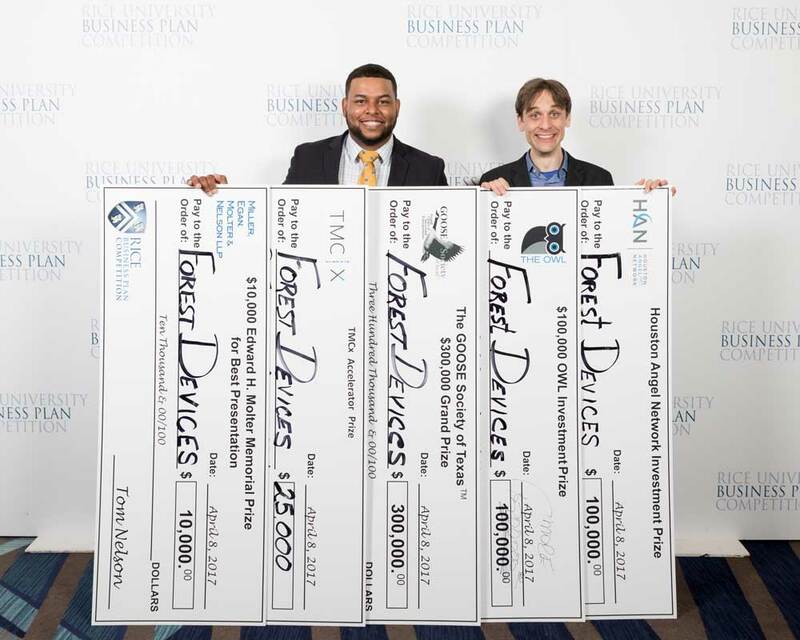 Forest Devices, Inc. wins the 2017 RICE Business Plan Competition. PITTSBURGH – (April 11, 2017) This past weekend, Forest Devices, Inc. competed in the annual RICE Business Plan Competition (RBPC) and won first place and over $600,000 in cash and prizes. The RBPC, the world’s richest and largest graduate-level student startup competition, is hosted and organized by the Rice Alliance for Technology and Entrepreneurship and the Jesse H. Jones Graduate School of Business. Brad Burke, the Managing Director of the Rice Alliance, commented that this year’s competitors were the most diverse in the history of the competition and came from top universities around the globe. Teams competed against each other by delivering a one-minute elevator pitch followed by their respective fifteen-minute investment pitches, which spanned from Thursday evening to Saturday afternoon. Edward H. Molter Memorial Prize for Best Presentation – Provided by Miller, Egan, Molter, and Nelson, LLP.